We left the corporate world more than 15 years ago, and never looked back. Since then we’ve worked only for ourselves and learned various methods for generating income from home. For the first ten years, we grew a profitable marketing communications agency serving worldwide clients from our home office in rural Humboldt County on California’s rugged redwood coast. 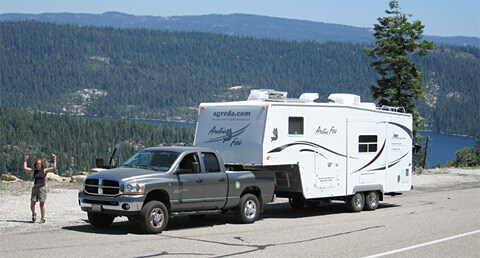 After selling that business, and nearly everything we owned, we hit the road to travel in a new truck and fifth wheel trailer with our dog Jerry. What we thought would be a one-year sabbatical turned into the dream lifestyle we enjoy today. Jim enjoys his changing office view. We are younger than the typical retired RVing couple. And the sale of our first business didn’t come close to bankrolling an early retirement. Our secret is to live within our means and work hard on things we are passionate about. And we love having the option of changing our office view whenever we get the urge to ramble on. One of the most valuable lessons we have discovered over the years, is the importance of passive residual income and diversified revenue streams. 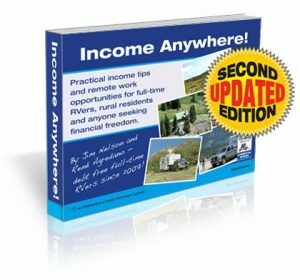 Now we are happy to share what we have learned as debt-free travellers since 2007 in our new e-book, Income Anywhere! New! Updated second edition includes even more home based business opportunities and remote employment resources. Income Anywhere! teaches aspiring nomadic business owners and anyone who wishes to work from home how to avoid the pitfalls that many people make when setting out on their own. The strategies we’ve outlined in this book have worked great for us as we have travelled the country over the last five years, and can do the same for anyone who wants to succeed as a location independent entrepreneur. Download free sample chapter now! 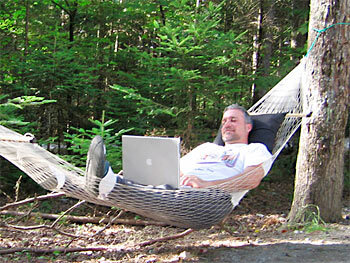 Learn how we support our dream lifestyle as we work from home, wherever we go. You can do the same if you have the desire to work for yourself, and the passion to make your dreams come true. 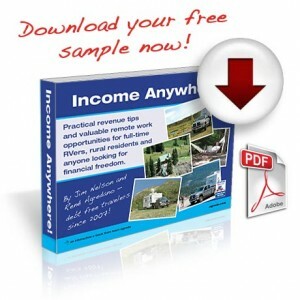 Download Income Anywhere! to take charge of your own destiny today. Income Anywhere! 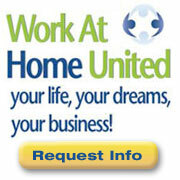 is ideal for anyone yearning to break free from the confines of a traditional job. 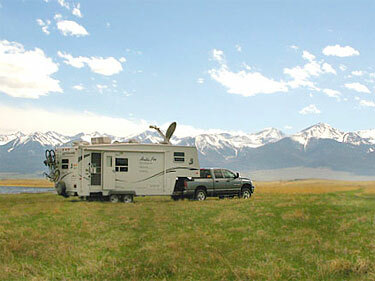 Readers of this 58-page manual about nomadic living and remote work opportunities will learn about the practical money-making methods we use to make a living from our RV as we travel the back roads of North America. NOTE: Click the share link below to save $5.00 now! Home-based business ideas are all over the internet, but for the average person yearning to make money outside a traditional office, it’s tough to discern between legitimate opportunities and dangerous scams. This is why we dedicated one full chapter of Income Anywhere! to the warning signs of MLM schemes and pyramid scams. Download this free sample chapter to learn how to identify legitimate revenue sharing businesses. Or, download the complete book now for hundreds of links to resources for selling online, finding remote employment opportunities, and much more. Digital Product Only, Download Immediately! NOTE: No Physical Books Will Be Shipped. 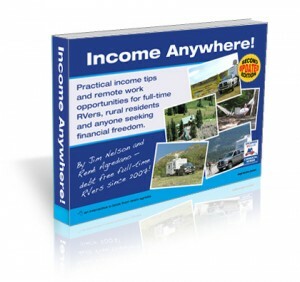 To learn to reap the benefits of passive residual income and diversified revenue streams, read Income Anywhere! If you don’t find the home based business resources within this e-book beneficial, just let us know within ten days and we will return your money, no questions asked! We hope you’ll find our story inspirational and are confident the tips and links we share will be helpful. We also gladly welcome any feedback you may have for improving the book. For less than the price of a grande mocha, you can take charge of your own life and start living it on your terms! Click the share link below to reveal your $5.00 coupon code and download this resourceful e-book now for just $4.95. Work from anywhere to follow your dreams! $5.00 Off Income Anywhere E-book! Share this link to reveal your coupon for $5.00 off our Income Anywhere e-book! That's only $4.95 for this comprehensive guide filled with tips for supplementing or replacing your income while working from home. Share now to save $5.00! Nice meeting you Rob, thanks for the comment and happy travels! I tried to register on your website to order the ebook “Income Anywhere” but it said Registration has been disabled. Bummer!!! So how do I register to order the book? There is no need to register for this site to download the book. All you need to do is enter your email address and any applicable coupon code, then complete the secure checkout via PayPal. Thanks for asking! Where do we enter the email address to download the ebook? I am on Google Chrome browser. Click the Buy Now button to enter your email address and preferred payment method. Site registration is not required. Upon checkout you will be redirected to the download page and sent an email with your download link. Thanks! I purchased the book, entered the coupon code, and the money has been taken out of my account. I cannot download the ebook. Please advise. Thanks! Please check your email for a message from us Carrie! We’ve confirmed downloads are functioning, and would love to know what type of trouble you encountered. Hi Jim! I have gone through all of my emails and see no email anywhere. Could you resend the email to glittergirl59@hotmail.com? Thank you! Looking forward to reading your book and using it! Thanks for the comment Dwayna! Please let us know if you experience any problems ordering the book. We currently have no order with your email address. Hi guys, I’m interested in buying your ebook but the share link for the discount appears to be broken and isn’t appearing. Thanks in advance for fixing that. Thanks for bringing that to our attention Dave! We’ve fixed the social widget and confirmed the code displays after sharing the post. We’ve also emailed you the code for your convenience. I shared your link to the book on twitter but did not get the coupon code for the discount on the ebook. Please advise. Will it come in an email? Thanks Taryn! The link appeared in the pop-up window after sharing the post! Email or message us, and we’ll gladly send you the coupon if you missed it.